I recently fished in Montana for a week near the town of Missoula. I met up with my buddy Matt, who usually fishes with me in Maryland a few times a year. He relocated to Montana, put me up for a week and showed me some of his favorite spots. We floated a number of bigger rivers in the area, and waded some choice sections of other medium sized rivers. 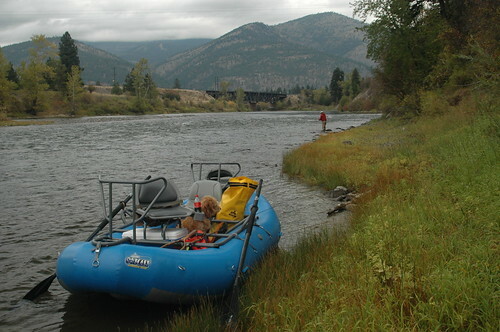 After a few days of fishing smaller stuff, we dropped his raft into the Clark Fork for a long float. The sky clouded up and the air temp was cold with a light wind. The sky threatened rain all day, but only drizzled for a few hours in the afternoon. I fished streamers and nymph rigs from the boat as we floated through wide riffles and deep green pools. The river was huge, and I had limited time to hit the good spots. I switched from streamers to nymphs and had a few hits on both before we shored up in a nice riffle. Matt suggested a big rubber legged nymph he tied and we were both into rainbows right away. I hooked a nicely colored sixteen to seventeen inch bow with shoulders that leaped out of the river three times. The fish eventually threw the hook, but we landed a few smaller bows and whitefish before moving on. I switched flies and tactics frequently until a steady rain started to fall. In a long flat BWOs started to emerge everywhere. It didn’t take long for the fish to start rising, so Matt slowed the boat as I cast to fish. The fish were pretty eager to to eat the size 20 snow shoe olive pattern, but I stung many more than I landed. We kept searching for larger heads in amongst the pods of smaller bows, but never found any bigger fish. I wanted to shoot some pics and film the hatch, but feared the rain would ruin my camera. One camera bit the dust the previous day for reasons unknown to me. The rain eventually stopped and we waded a big run, both fishing nymph rigs. We asked the normal “head or tail,” deciding who wanted to fish where. I chose the tailout, and was quickly into a whitefish. Matt hollered something from up river, and I scrambled to get the net and camera. He was hooked up on a big brown, and we quickly got the fish into the net. This was one of his bigger browns from this stretch, which was not known for producing browns. I snapped some shots and video before he released the fish. The sun had dropped far behind the mountains, so we moved on to the takeout. In this video post I included some footage of the Clark Fork, and Matt’s big brown. This entry was posted in fishing report, video on October 16, 2010 by Jason du Pont.